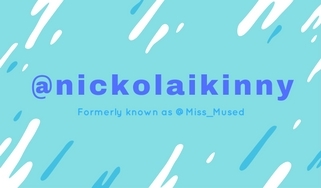 Many of you would have recently noticed the sudden name change on all my social channels from @Miss_Mused to now being @nickolaikinny Changing your name so dramatically and without warning isn’t something many of us would consider, so I thought it would be fun to tell the story of why I changed it and then tell you the story about a girl who was once known as @Miss_Mused. My real name is more memorable. Most people i meet, remember me by my first name because its not everyday you get to meet a tiny Indian girl with a Russian man’s name. @Miss_Mused started as a private account on twitter back in August 2008 and when it went public it was mainly known to a limited few and only in my immediate twitter circle. Why @Miss_Mused you ask?? Its cause she’s always making mental creative notes, some of which have The 404 or not found error message when needed and the others make it to her blog Adventures of a tiny lady…which consists of her thoughts & snippets from a personal view of , 4 feet 11 inches above the ground. Apart from that she is a happy being.. Who finds joy in travelling, writing, clicking, reading, occasionally baking, ideating and wandering. She’s in love with Comic books, Vivaldi, Tetris, Chai, Purple & Luke (Her cam) 🙂 @Miss_Mused loves twitter because it helps her connect with like minded people with common interests, great ideas and awesome link spamming capabilities 😛 @Miss_Mused will always be amused by life and its intricacies and shiny things ! !